Machen Sie sich einen Vorsprung bei Ihrer Besichtigungstour und vermeiden Sie die Menschenmassen mit einem frühen Zugang zu den Vatikanischen Museen, bevor die Türen für die Öffentlichkeit geöffnet werden. Beginnen Sie mit dem VIP-Eintritt in die Sixtinische Kapelle, um diesen wunderschönen Raum in Ruhe zu erleben. Fahren Sie fort, um den Rest der Vatikanischen Museen vor der Öffentlichkeit zu sehen. Wählen Sie eine Tour mit einem kunsthistorischen Expertenführer oder einer selbstgeführten Audioguide-Tour. Erkunden Sie die beliebten Vatikanischen Museen auf dieser Tour für den frühen Einstieg. Betreten Sie die Sixtinische Kapelle zuerst, 15 Minuten vor anderen Gruppentouren und 75 Minuten, bevor sie für die Öffentlichkeit zugänglich ist. Genießen Sie es, diesen exquisiten Raum ohne die übliche Menge zu sehen. Fahren Sie weiter in die restlichen Vatikanischen Museen, um die riesige Sammlung zu sehen, bevor die Räume zu voll werden. Entscheiden Sie sich für eine selbstgesteuerte Tour durch die Museen in Ihrem eigenen Tempo mit einem Audioguide, oder erweitern Sie das Upgrade, um eine Kleingruppentour mit einem professionellen Guide zu erhalten. Absolutely do this but the tour company was highly chaotic at gathering the group. After the gathering and they got us in, this was TRULY skip the line.I was told that skip the line was not really skip the line as there is still a small wait time but this was, they really bypassed that crazy immense crowds even at 7:30am in the morning, the lines for the normal entrance is crazy think 20,000 people trying to get in. So for anyone going at peak tourist season, the waking up in the wee hours of the morning, getting there early and doing this was WELL WORTH IT. Your crazy not to pay the extra to get in early. By noon the place was wall to wall people, hot, smelly and not at all enjoyable. This was a great way to enjoy the Vatican Museums - before the crowds arrive after waiting in long lines outside. Our tour group was small and we were able to move at our own pace with the recorded audio provided. The Sistine Chapel was breathtaking. Because we had tickets to the Papal audience, we went through the museums relatively quickly but you could easily spend much time there. Thank you! There were only 8 of us and we were the only people in the Sistine Chapel for nearly an hour. We met the guide across the street from the museum at 7:05 and then waited around until we could enter the museum at 7:30. Then we were given our tickets and maps and were on our own to look at other things until the Sistine Chapel opened at 8:00. In winter when the lines are shorter, I'm not sure it's really necessary to meet so early. Also, since the chapel opened at 8:00 instead of 7:45, it wasn't clear to me why they claim you will get in 75 minutes before the public, but it was still great. Epic, simply epic. We were two out of 8 total people in the Sistine Chapel and spent nearly an hour there alone. 100% worth it. We enjoyed this tour very much despite standing in the rain for over 30 minutes as the doors opened at 9:00am instead of 8:30am due to the Pope having a special mass for All Soul’s Day. Paula was a wonderful guide through all the exquisite art, architecture and history! We were literally the only people in the Sistine Chapel for a few minutes...let that sink into your head. Amazing. TIP: You meet right where it says you meet-at the top of the stairs by the cafe. There are many other tours meeting at the foot of the large steps-this is NOT your tour. Stay at the top. The location meeting site outside a caffe was confusing with many other tours meeting in the same place. The guide was late. She was very friendly and spoke several languages. Too bad the caffe was not open at the appointed hour so we could have bought a cappuccino and enjoyed it while we waited. The information provided on the web-site was not exactly what we experienced. Truth in advertising would help. The only 'down' of this is that you can not go to the Sistine Chapel first and then go to the museums - as there is a 'one way direction' in the musea and the Sistine Chapel is the last place to visit. 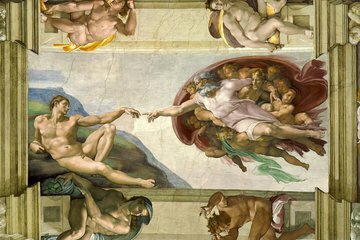 Nevertheless, we are really happy to have booked this ticket: not too many people in the Sistine Chapel by the time we got there and we could take all the time we wanted/needed. We were the only ones in some of the other musea: extraordinary feeling and we enjoyed some art we wanted to see even more thanks to this e.g. Laocoon group sculpture and School of Athens by Raphael. Our tour guide was very well informed but the tour got to lengthy. Taking us outside to review the paintings of the Sistine Chapel was time not well spent. And then having us go back in the Chapel for a second look with all the crowds was just unnecessary.